Thunder and lightning, wicked winds and heavy rain, six days of grueling restoration treatment, a massive holiday dinner, and tons of laughter. In short, the past two weeks have been all sorts of incredible and filled with many moments worth reflecting upon what we have to be thankful for out here on Kure. The week before last, the winter crew got to experience just what it’s like to be “trapped” on a remote island and live according to Mother Nature’s guiding hand. Under normal circumstances, we work throughout the week focusing our efforts on restoration treatments unless there is enough rain to inhibit the effectiveness of us spraying. On those days we might do other tasks like data entry, marine debris removal, or out-planting native plants that would love the extra water. However, since safety is our highest priority, when lightning strikes nearby it’s time we stay indoors or at least within camp. You can imagine why this is the case when you are on a low-lying island, days away from help, with few tall-standing objects that might take a strike first if one were to move over the island. For four days we stayed locked down within the main house entrenched in card game after card game until the eventual test of a group puzzle when we needed a change of pace. Reality TV show or not, you’d think that much time together in one single room would lead to conflict or confrontation but it almost brought us all closer together if that was even possible. As we bonded, laughed, and grew antsy by each day’s end, we got to witness spectacle after spectacle of Mother Nature’s glory throughout the storm. 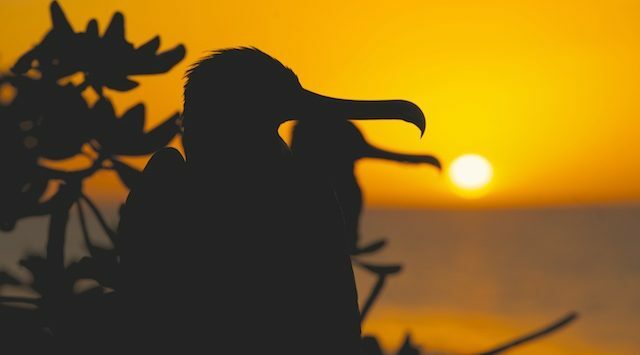 Drenched with nine-plus inches of rain, the island took on a new appearance with its water ladened soil and wet albatross who loved to try and nip raindrops falling from the sky as they sat upon their nests. Night after night, we stood by windows or on the porch watching lightening put forth dazzling light shows across the lagoon with flashes so bright they’d light up the island as a perfect horror movie scene and insight to the life of albatross in the darkness of night. Strong winds and gusts reaching up to 63 miles per hour gave off jolting bursts of energy especially when one flipped open a trash can and we had to make a mad dash outside to grab things that blew out. Even with all that happened, never for a moment did anything feel threatening or our situation worrisome. There was a beauty to being there within everything taking place and the house stood rock steady as the perfect fortress to feel it all from. Once the winds finally settled down and the clouds had moved out, the days lost inside meant we’d hit our toughest treatment week to complete our second full island treatment rotation just before Thanksgiving. It was six days of tough naupaka Restoration Areas but we handled it like champs and continued to make progress to reach our goal of a 30-day full-island treatment schedule. By week’s end, bodies were sore and mental sharpness wavered but we all felt accomplished in the work we had done and the festivities and three day weekend ahead. Choosing to celebrate Thanksgiving on Friday-since none of us would be Black Friday shopping or anything-there was a well-orchestrated rotation of food prep and kitchen work to lay down a feast fit for the week we had finished. The holiday and the collaborative meal were each a chance to look back and reflect on how much we have to be thankful for. Each part of the storm was a reminder of the unique opportunity we have seeing things few might never see or readily believe. The tough week was a reminder how lucky we are to have a crew of eight dedicated, fun-loving people who can handle challenges while striving to achieve a fast and effective treatment schedule. Our time together well after dinner ended was a reminder how fortunate we are that those eight people have formed much more than a workplace bond and continue day after day to be the best company you could ask to keep for thousands of miles in any direction. Life on Kure has been pretty great. I’m sure I speak for us all that we would cherish the chance to have spent time with family and friends back home but know this, we’ve got plenty of stories to share the next time we get to celebrate together. The season is almost halfway done and already we’ve got a lot to talk about.